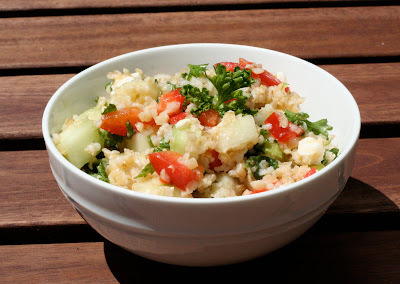 In a large bowl combine the bulgar wheat with 2 cups of boiling water and let it sit for about 45 minutes until the grains are soft when you eat them. Drain the wheat in a fine sieve, removing all of the excess water. Add the vegetables, herbs, lemon zest and juice, and feta. Stir to combine and add a drizzle of olive oil. Season to taste. I like mine cold, but you can eat it at room temperature as well. Enjoy! Thank you for this recipe! Making a list of healthy, tasty meals for this summer and this fits in perfectly.